An outcrop on Mars informally named "Chester Lake" is the second rock on the rim of Endeavour crater to be approached by NASA's Mars Exploration Rover Opportunity. The rock could hold clues about ancient Martian water. NASA's Opportunity rover has found an intriguing rock that could offer clues into Mars' wetter past. Opportunity is more than seven years into its roving mission on Mars and arrived at the rim of the giant Endeavour crater in August. Just last week, the rover began studying a rock scientists have named "Chester Lake." The Mars rock appears to be much older than the geologic formations Opportunity has so far encountered. The robotic arm of NASA's Mars Exploration Rover Opportunity casts a shadow on a rock outcrop called "Chester Lake" in this image taken by the rover's front hazard-avoidance camera. The image was taken during the 2,710th Martian day, or sol, of Opportunity's work on Mars (Sept. 8, 2011). Opportunity and its twin rover Spirit landed on the Red Planet in January 2004. Both rovers far outlived their initial planned 180-day missions, but in May, NASA cut off communication with the ailing Spirit. Opportunity, however, is still going strong. "Opportunity is just a really well-made vehicle," the rover's deputy principal investigator Ray Arvidson, a planetary scientist at Washington University in St. Louis, said in a statement. "It's way, way beyond warranty. It was supposed to drive about 600 meters and so far it's gone 33,500 meters in round numbers, and has taken maybe 150,000 pictures by now." "The ancient rim of Endeavour represents a period when there was probably a lot more water on the surface," Arvidson said. "So, we're trying to get the chemical, mineralogical and geological setting to 'back out' those ancient conditions to reconstruct environmental conditions during this earlier time period." While most Martian land has been covered over by more recent geological processes, the terrain at Endeavour crater's rim is thought to date back to Mars' earliest days, about 3.5 to 4 billion years ago. At this time, the Red Planet was being bombarded by space rocks that had not yet collected into larger bodies like planets and huge asteroids. Endeavour crater itself was likely created when one of these slammed into Mars. 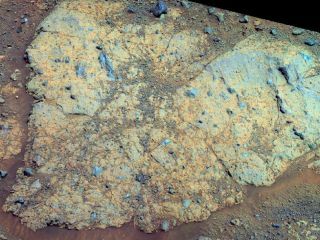 The Chester Lake rock is a so-called breccia, meaning it contains many broken fragments of rock that have been cemented together, likely when Endeavour crater was formed. Researchers plan to use Opportunity's Rock Abrasion Tool (RAT) to clean off a layer of the Chester Lake rock's surface to expose deeper material. They hope this material will contain clay minerals that formed in the presence of water. "Clays form in more neutral, less acidic conditions than the sulfate-rich sandstones we've been looking at," Arvidson said. "Our hypothesis is that if there are clay minerals, the water was less acidic and therefore more conducive to life."